The crickets are chirping outside as we sit in the kitchen, wondering what's next. It's 22:00, we are alone and have just eaten spaghetti a la Bjarni. It seems that tomorrow we will have to leave this place that has been our home for the past month. We are trying to contact the landlord, to find out whether it is possible to extend our stay over the weekend, to sort a few things out, and if not - what time the room must be empty. Her phone is silent and we still haven't gotten a reply to the mail we sent yesterday. I realise it has been a month - A MONTH! - on the road. A month spent sightseeing in a city of millions and getting lost on its streets. A month of cooking european meals in a mexican kitchen. A month of me fighting in our living room with Spanish while Bjarni maniacally improves the code of our photo album. A month in which I become used to the city enough to tell Bjarni I am getting bored here. And suddenly it strikes me how much this place differs from the things I got used to in Europe. I relive our arrival, the mild culture shock that hits me on our way from the airport to our new home. It is late at night: police patrols flashing their lights on the streets of our supposedly safe neighbourhood, shabby houses with the laundry drying on lines, the gate we pass through to get to our home. The very next day, when I go barefoot to the fridge for something to eat, a large cockroach scurrys across the floor. I decide to always remember to wear shoes but as I don't meet him again, in about two weeks I forget my decision. And then I see him again - on the street this time. Mexico becomes to me the city of policemen with shotguns. The unbearable smell of baked corn. Unnur and Adrian forever late. Security guards at our gate who we still can't tell apart, even though there are only two of them. Probably. Mexico is broken sidewalks, dark grey, unpainted buildings and thousands of cars on the streets. It is chaos, noise and mariachis. It is a beautiful palace in the Chapultepec park, colorful boats on the Xochimilco's canals and a few hour's fun in the Six Flags amusement park. Here I eat tasty sincronizadas - three pieces for 15 pesos, bought from a vendor on our street. I drink incredibly cheap juice made of fresh fruits. And I can't wait to leave the city. The three trips we have behind us do their job. Tepotzlán gets me accustomed to Mexico's bus system and whets my appetite for pyramids. The view of the 75-meter-high Pyramid of The Sun in Teotihuacán, the world's third largest, makes me aware of how small we are. 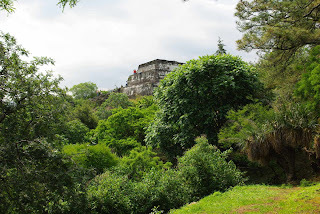 The trip to Toluca that turns into a birthday party in Metepec and sightseeing of little known pyramids in Teotenango de Valle, my favorite so far, causes me to keep wondering what else Mexico will suprise me with. But for now though, the crickets are whispering to us and we still don't know what, where or when. Two days ago we went on our first day trip out of Mexico City. 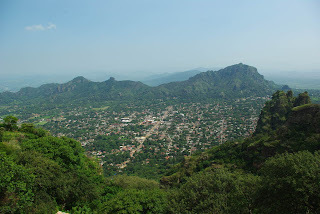 Our destination: Tepoztlán, a little town about an hour South of the city by bus. The adventure began at the Taxqueña station, which is the Southern-most station on our local metro line, only one stop South of our station, General Anaya. 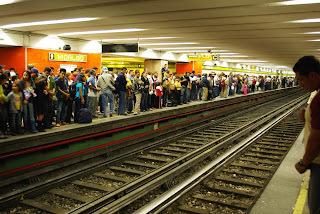 Taxqueña is incredibly busy and chaotic; it is a place where the metro connects with a light-rail, local city busses and the main bus terminal for the Southern part of the City. And of course there are hundreds of vendors hawking everything from freshly squeezed juices, to crazy Mexican food to pirated DVDs to batteries and backpacks. However, as Taxqueña was also the beginning of our trip to Xochimilco and the end-point of our day at the Six Flags amusement park, by now we kind of know our way around. We found the bus terminal with no difficulty at all, and after some over-the-phone encouragement and explanations from Unnur we found a bus operator who would sell us tickets and tell us which of the 4 exits to take to find our bus. And soon enough, we were on our way. The ride was very pleasant, Mexican long-haul busses are very comfy. When we weren't admiring the view of the mountains South of the city, we could enjoy a Disney flick about indians and bears, in Spanish of course. Great practice? The bus dropped us off, apparently at a gas-station in the middle of nowhere. But signs and my phone's GPS all assured us that we were very near Tepoztlán, so we picked a direction almost at random and started walking. After about 10 minutes we found ourselves on the town's main street and after another 10 we were ordering quesadillas for lunch in the market in the town center. We took a look at the local Unesco World Heritage cathedral (pretty) and then set off to find the mountain path to the Aztec temple that was supposed to be nearby. According to pages torn from our guidebook, all we had to do was keep walking down the main street until we found ourselves climbing a mountain. And so that's what we did. The climb was very, very pretty. And a lot of work; Ewelina loves to walk, and she loves to walk as fast as possible. Slowing down just because we were walking uphill a little bit wasn't an option, even if she started to feel a bit tired, and then a lot tired. So we practically jogged up the top of the mountain, climbing in 45 minutes what our guidebook said should take 1-2 hours. At the top we sweatily admired the amazing view of the town, valley and surrounding mountains, catching our breath before climbing up on top of the little pyramid we had come to see. It was really quite amazing. All over the area there were small mammals which didn't seem afraid of people at all; quite the opposite, if they got the impression you had something edible, then they would surround you and eventually try to climb you. I know, I got climbed as punishment for waving granola bars at them. 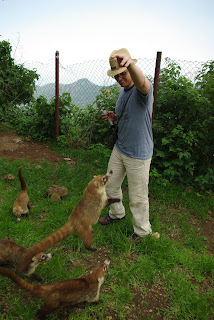 After some googling I'm pretty sure these were white-nosed coatis, apparently relatives of the raccoon. After we had had our fill of the view and the coatis and the temple, we made our way back down the mountain, again going as fast as could be considered safe. We were home by nine and spent most of the evening laying on the floor and laughing helplessly at a quite amazing reality-TV show called 'I survived a Japanese Gameshow!' Not Mexican at all, but great stuff all the same. This past week has been quiet. Ewelina got a bit of a cold, which kept us at home for a couple of days, and I have been quite obsessed with working on our photo album. We've still been out and about, seeing new things though. We discovered a nice little restaurant in central Coyoacán which serves excellent fresh juices and amazing food, for very little money. We have explored San Angel, a neighborhood with a quite amazing crafts market. We still haven't looked up exactly why Trotsky and Frida's husband Diego Rivera stopped being pals, but we're guessing the affair Frida and Trotsky had may have had something to do with it. But we're just guessing. 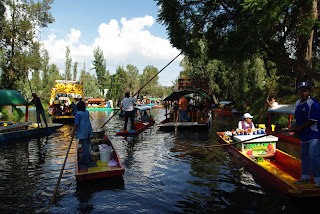 Today we went with Unnur and Adrian to Xochimilco, a neighborhood in the South of Mexico City which is famous for over a hundred kilometers worth of canals. We rented a boat for a couple of hours and just sailed lazily about, marvelling at the floating Mariachis, the floating beer vendors, the floating food shops and of course all the other holidaymakers floating around on their own colorful hired vessels. It was quite an amazing day. We are starting to think about venturing out of Mexico City and even considering which country to visit next. Guatemala? Cuba? Belize? All of the above? Unnur and Adrian on the other hand keep telling us about cool things we could do in Mexico if we just stay a few weeks longer... so we'll see how that all goes. Ewelina and I have this really nice Pentax K200D camera with us on our trip. We have over 4000 photos on our little hard drive, including pictures from Poland, Iceland, Spain, Dublin and Mexico. While visiting us in Dublin, my friend Árni showed us the KPhotoAlbum tool which has made managing our photos much easier. We have them organized and cross-indexed and finding stuff is easy. However, obviously we also want to share our photos with you guys. For starters there are only three albums published; we'll be adding more during the next few days and hopefully adding some sort of preview to the blogs so people can easily see when new photos are posted. Now, go admire our photos! Last night Ewelina and I went out with Unnur and Adrian. The goal was to taste pulque and explore some questionable bars in downtown Mexico City. I think we succeeded. Pulque is a moderately alcoholic beverage made of fermented maguey (a big leafy cactus). Served straight, it is a milky white, slimy beverage which reminded me quite a bit of some of the ickier things Icelanders do to milk. Tastes are always hard to describe, but I think if you imagine the result of putting a tablespoon of dirt, a cup of pond scum and some skimmed milk in a blender, you might get close. I think it's safe to say I'm not a fan of pulque, but I'm glad I tried it. It was an experience. 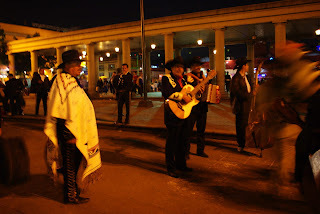 After the pulque we visited a quite busy square which was full of mariachis in full regalia. When we arrived, most weren't actually playing due to a soccer match involving Mexico and some other Latin-American country. Watching the match obviously took precedence. Adrian went and found gigangic beers for us, which Ewelina and I eagerly used to wash away the taste of the pulque while people-watching. Aside from the beggars bothering us with 'moneee pleees', we were soon approached by a friendly drunk guy who offered us swigs from his bottle of rum and an old geezer who offered to sell us cigars or electrocute us. We weren't interested in smoking, but how could we say no to a bit of friendly electricity? For 10 pesos each we got to take turns holding metal rods connected to thick wires leading to a little box with a dial. The friendly old guy then slowly cranked up the voltage, cheerfully informing us that we had cuarenta, cincuenta, sesenta! volts coursing through our torsos. Adrian was crowned champion at 80 volts, until we teamed up: I took a rod in one hand, Unnur's hand in the other. Unnur held Adrian's, and he held Ewelina's hand and the other rod. Together we laughed our way to 90 volts and the old dude didn't even charge us. Ewelina tried to take pictures, but it was dark and for some reason we didn't want to sit still. Shortly after our fun with electricity, a minor argument broke out between the well dressed mariachis and our drunken rum-drinking friend's rather more shabbily dressed mariachi wannabe. Apparently they didn't want him on their turf or something. Adrian calmed people down, but we took that as a sign we should put some distance between ourselves and the drunken dudes. So off we went to find a bar, for one last beer. After much walking and some peeks into some very questionable establishments, we found a rather tidy looking place that was still open. 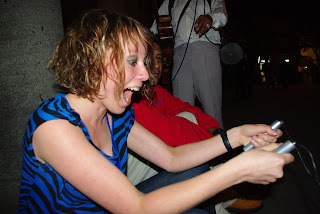 But instead of one beer, we decided it was high time to try some real Mexican tequila, and real Mexican mezcal. Apparently that's a bit redundant as tequila is just one type of mezcal, but whatever. The owner of the bar was there and decided he liked us, so he sold us 'the good stuff' and kept the place open for us. He showed a rather predictable interest in the pretty European girls, but aside from some sleazy vibes he was a perfect gentleman. We declined his offer of white powdered refreshment, sticking with our drinks. Today has been a quiet day. It is raining. Not like it does at home, where at this time of year one expects a light, warm rain or a sudden, short-lived downpour with lightning and thunder. Nor like storms in Dublin, where one almost never hears thunder but instead it rains constantly, continuously. In Mexico, the rain is different, heavier, louder. The last two days of sun seem like a distant memory - and yet it has only been raining for half an hour. Sitting in our safe house, I have the feeling that the rain is trying to burst inside, banging on the walls with all its strength, probing the limits of their resistance. The rain is sneaky, it quiets down for a moment, only to attack again with twice the force. It seems to Bjarni that he is in a middle of a very noisy waterfall, and - remembering our trip to Seljalandsfoss - I can't resist a similar impression. A part of the sky remains light-blue, another part is already hidden behind the big, heavy clouds, beautiful and scary at the same time. It's impossible to see anything through the window - all one can see is those big, big drops hammering against the pane. Bang, bang, bang..
We've only been in Mexico for a week and I have managed in the meantime to both hate and love this city. Lying over 2000 metres above sea level, surrounded by mountain ranges, the city itself is an abode to almost 9 million people. The city and its subjected areas is home to over 20 million, which makes Mexico City the third most populous city agglomeration in the world, after Tokyo and Sao Paulo. The crowds are everywhere here: on the streets, in the parks, in the metro. The city is loud, jammed and polluted. The buildings lost their lively colours long ago and nowadays the whole city centre seems to be homogenously grey. The sight of policemen on the streets, with their shotguns and belts full of bullets, instead of reassuring, makes you wonder how dangerous it is here. TRANSIT cops direct the traffic but it's still not enough to silence the honking horns, warnings in the chaos. What looks like a roundabout is not one after all and it's almost impossible to make heads or tails of the lively intersections. Poverty coexists here with wealth. Shabby buildings are lined up with skyscrapers. On the metro, one encounters all sorts of peculiar people. Singing and shouting beggars. Peddlers of CD discs with backpacks stuffed with huge speakers, playing their wares at full volume, offering what must be counterfeits for 10 MXN (now in style: Michael Jackson). Children/youth/elderly selling chewing gum/algebra books/crosswords/... The metro itself is very cheap: for 2 MXN (about 0.10 euro) one can buy a one-off ticket, valid until one leaves the system. One can change lines, eat, shop, drink, travel back and forth - for 2 MXN one could travel forever if only the metro didn't close at midnight. The centre of Mexico City scares me: it's incredibly chaotic, dirty and overcrowded. I'm slowly getting used to my surroundings though and I'm starting to see the pros of the city: an abundance of museums; the beauty of the picturesque stalls of the Coyoacan market that takes place every weekend; the ideal taste of iced coffee in a small cafe we encounter by chance; reasonable prices in the restaurants; billiards close to our house. 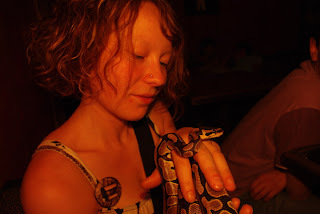 I'm discovering new things about myself: for example the fact that I dislike the smell and taste of baked corn, that I am actually capable of touching a snake, if only for a few moments. My only concern is that at this rate, I will end up loving spiders - and that would make me a completely different person..
Mexico City is really, really big. The plane we flew in on, was also really, really big. 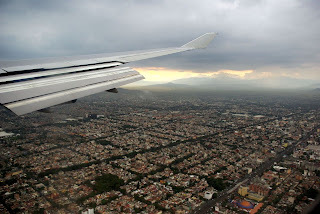 Mexico City is surrounded by mountains, which we could see in the distance as our plane came in for landing. Between us and the mountains was nothing but thousands upon thousands of houses. As we came closer, we could see that they were in all sorts of strong colors, but we could also see that they looked pretty run-down. On the plane we had realized that we had forgotten to write down the address of the room we were renting. The only contact details we had for the landlord were phone numbers in my phone's outgoing call-list, numbers that had never been answered. We filled out the immigration forms from memory. We did pretty well, we only got the name of the street and all the numbers wrong. I figured we would find an Internet connection soon enough to discover the truth. Airports always have WiFi, right? Ewelina was a bit skeptical, I lived the Icelandic motto: Þetta reddast! (It will work itself out). It did. After the cheering Mexicans, we hung out outside some random café, borrowing free WiFi and reading GMail on my phone until we really knew where we were going. Then we extracted much money from an ATM and found a cab 'home'. We have a nice, if quite basic, room and our own bathroom. We have WiFi and cable television. We share the house with an American/Mexican couple and the cleaners come on Wednesdays. 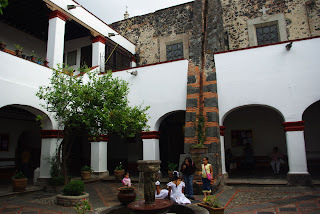 We are about 15 minutes walk from the center of Coyoacan, which we are told is one of the city's nicest neighborhoods. We are 2 minutes away from a subway station which takes us directly into the center. We have walked a lot, we have eaten in ridiculously cheap restaurants, we have played pool and we have gotten drenched by the rainy season's storms. We have listened to beggars shout, sing and act out little plays on the subway. We have waged war with mosquitoes, we have gone shopping and we have cut my hair. I have become quite addicted to my Android's GPS and the AndNav2 program which has kept us from getting lost at all. Jeg-lag hasn't been a problem and we haven't gotten sunburnt or robbed or sick.